Donald Trump won the US elections. I admit that I was thoroughly shocked, given that electoral surveys historically predicted a Clinton win. I guess the scandalous Podesta emails [NBC], which gave the American public invaluable insight on the corruption pervading the political establishment, did her in. The reactions to Trump’s win have been mixed. We can expect jubilation at the Trump camp, that’s a given. However, what surprised me was the magnitude of the reaction from the other side: passionate Clinton supporters crying in disbelief, the crash of Canada’s immigration website, etc. There shall be a truckload of articles that will attempt to predict what Trump’s win entails for America, that’s a given: I will not be writing another article just to add to that noise. A Trump win may be good for the Philippines, and let me tell you why. What’s clear is that Duterte’s campaign woke up the anger of the populace of decades of post-Marcos government incompetence. If the population will simply hold a peaceful anti-Robredo EDSA Revolution, that would be relatively bearable. But who can serve as a tolerable replacement? And will the people be able to temper their anger and frustration while at it? If neither condition is fulfilled, this civil unrest may likely lead to widespread civil disobedience and even bloody riots. I sincerely pray this won’t happen, but we can never discount this possibility. If the public finds out that the US helped LP depose Duterte, there’s a real possibility of potentially violent retaliation against about 30,000 [PSA] Americans in the country. We know that isn’t good. Duterte is the first president to give Muslim separatists and communist rebels a real shot at peace after decades upon decades of failed government promises, and it’s likely that the latter believe that this is their last chance at attaining it. This cannot be more true for Nur Misuari who, like Duterte, is already of advanced age. That is, Duterte’s removal may translate into a civil war [Inq] with a prospective Robredo Government on one side and a hodgepodge alliance of Muslim rebels, communists, and extremely disgruntled citizens on the other. I may (emphasis on "may") even be one of them. But most importantly, deposing Duterte will leave a fractured nation that provides easier entry for ISIS if and when the latter gets driven out of the Middle East. Duterte: ISIS. When? I really do not kow. But are they coming? They will come. Yes, it’s that bad, but the oppositionist Liberal Party is at it, and it seeks to bolster its campaign by wooing American support. Duterte himself admitted that the government’s crusade against criminality, drugs, and corruption, along with his campaign to set up a Federal government and his attempt at etching an independent foreign policy, will take a considerable amount of time. Unfortunately, his political longevity is under threat as his international image continuously erodes. Today, the global public generally views President Rodrigo Duterte as an unrelenting human rights violator, with some camps putting him in the league of fallen leaders Muammar Gaddafi, Saddam Hussein, and Adolf Hitler. Duterte’s negative international image would have been irrelevant if not for the risk of public clamor that may trigger an International Criminal Court (ICC) investigation, a risk made more real by Gambian ICC Prosecutor Fatou Bensouda’s recent statements [Star]. An announcement of an ICC investigation of Duterte’s human rights record, let alone a conviction, will certainly obliterate the new president’s international legitimacy, drastically weakening his bargaining power in the international arena. And what happens when Duterte loses his international legitimacy? He can more easily be deposed by the pro-US opposition led by the Liberal Party, and with help from the United States. An assassination., an ICC conviction, an accident… There are many ways to do it. Yes, a President Leni Robredo may not be palatable for most Filipinos, but for LP, it’s better than nothing. LP can settle for someone who may not enjoy local support, but enjoys international recognition, similar to the kind of presidency Gloria Macapagal-Arroyo had. But will the US really help LP kick Duterte out? Because the United States has a history of supporting, or even effecting, regime change in other countries to suit US interests. Because [TP: Duterte’s international policy realignment] is a humongous headache for the United States. Because the Liberal Party, a staunch US ally, has close connections with major US policymakers. If US vs Nicaragua says anything, it’s that the Americans are not averse into violating the sovereignty of other countries by financially supporting candidates who are better aligned to their interests. In 1989, the US Congress passed HR 3385 “to provide assistance for free and fair elections in Nicaragua.” [Congress], although it really was aimed to support the (successful) presidential bid of unpopular but US-aligned candidate Violeta Chamorro. But it’s not just about elections.The US has a long history of militarily intervening in other countries’ domestic politics, with the most recent one being the operations in Libya against Muammar Gaddafi [PBS], in Syria against Bashar Al-Assad, and in Iraq against Saddam Hussein [CNN]. All these three “Humanitarian Interventions” by the United States backfired. The Americans kicked out Gaddafi then the terrorists took over the Syrian Government. American operations in Syria led to the creation of ISIS [Harvard]. America’s overthrow of Saddam caused a power vacuum that eventually led to an ongoing civil war and the rise of Iraqi extremism [Time]. And Duterte has pointed out these three examples many, many times. In short, the US has done it before, so it can still do it again. For one, Ramos’ unexpected 180-degree turn over Duterte’s foreign policy is a testament to US pressure [TP: Team PH Losing]. At first I though it was a just an internal misunderstanding between Ramos and Duterte, until the latter threw major shade at the former president last week [Video]. Relations between the Philippines and United States took a massive turn for the worse as soon as Duterte occupied Malacañang, with the most poignant piece of evidence being Duterte’s détente with China. In one fell swoop, Duterte managed to position the country from a staunch US ally to somewhere in the middle of the US-China power struggle. And did I mention Duterte’s frequent anti-West tirades [TP: Hitler]? Duterte’s foreign policy realignment, in essence, is a major obstacle for America’s “Pivot to Asia”. Because of Duterte, America will find it harder to enhance its sociopolitical and military influence in Asia. I need not expound on this anymore. The Liberal Party has always been known to have very closed relations with the United States. Aside from the pro-American foreign policy decisions over the past six years that hurt Philippine interests [TP: Yasay’s Face], several key people within the party are known to have close ties with key people in the US political establishment. The Gerry Roxas Foundation, founded by LP President Mar Roxas’ father Gerry Roxas, has received a US$ 24 million grant from USAID. USAID, the American Government’s philanthropic arm, is widely considered as a covert tool for advancing US interests abroad at the expense of their host countries [QZ]. The organization has previously been expelled in Russia [BBC], Bolivia [BBC], Ecuador [NBC], Cuba, Dominica, Venezuela, and Nicaragua [VA]. That says a lot, but there’s one more thing: LP’s connection with Loida Nicolas-Lewis of the influential Washington lobby group US Philippines Society (USPS). USPS’ most vocal member, the billionaire Loida Nicolas Lewis, has actively campaigned for LP’s Mar Roxas and Leni Robredo [Inq]. This is the same Loida that Duterte accused of plotting to support massive demonstrations against the latter [FB]. Sitting as USPS co-chairman is Metro Pacific’s Manny V. Pangilinan [USPS], the same person who conspired with Aquino Foreign Secretary Albert del Rosario to sell us out to China [TP: Spratlys]. Philippine Ambassador to the US Joey Cuisia, also a USPS director, is not happy with Duterte either. He rejected Duterte’s offer to extend his ambassadorship, citing his dissatisfaction over Perfecto Yasay’s appointment as Foreign Secretary [TV5]. USPS Director Maurice Greenberg was Chairman and CEO of the insurance giant AIG [USPS]. AIG used to employ Mar Roxas, who in late 1990s tried to resuscitate the ailing insurance industry by imposing unnecessarily strict regulations on the pre-need industry, essentially killing the latter. The bankruptcy of CAP (College Assurance Plan)? Mar’s moves tremendously benefitted Greenberg’s AIG. Those of you who had to drop out of college because CAP closed down? Blame Roxas and Greenberg. But I am digressing. That’s just three of the links, but I’ll stop at this point because I want to limit this article to 2500 words max. Most Fil-Am leaders backed the Clinton campaign [Inq]. But among these Fil-Am leaders, the most important and most influential are those who belong to the US-Philippines Society. Nicolas-Lewis, arguably the most influential Fil-Am in the US, openly and financially supported the Clinton campaign [MT]. Greenberg financially backed Republican Jeb Bush’s campaign so it’s an indication that he dislikes Trump. USPS President John Maisto also openly denounced Trump [WaPo], so that’s support for Clinton. Among the USPS members, the most important is former US Ambassador to Manila John Negroponte, he’s taken an interest in the Duterte-era Philippines when he visited the new president in July 2016 [TV5]. What is John Negroponte most (in)famous for? Negroponte spearheaded the Iran-Contra Affair, which funded Nicaraguan rebels using profits from US arms sales to Iran, with the hope of overthrowing the anti-American Nicaraguan Government [PBS]. This scandal led to the Nicaragua vs US Case in the International Court of Justice, a case that US lost [BostonLaw]. SIDE NOTE: Nicaragua vs US is the same case that DLSU Prof. Richard “#MayMastersKaBa” Heydarian [Quartz] has been using to justify the South China Sea arbitration’s US$ 7 million (Php 328 million) price tag [ABS], whose result cannot be enforced for lack of US support [TP: Breaking Away]. There’s a reason why “face”, “brain”, and "humility" are three different words. Sounds familiar? Yes, Negroponte can basically influence Washington to do another Iran-Contra affair, with the Philippines taking Nicaragua’s place. But how influential is he? He openly endorsed Clinton and Clinton even gushed over that endorsement [Esquire]. That’s how big of a deal his is, as his interventionist philosophy heavily influenced Clinton’s personal geopolitical policy as she supported US-instigated regime change operations in Libya [FP], Iraq [FP], and Syria [Telegraph]. She has suggested a “review” of US policy in Syria during the election season, but we all know that it’s just to assuage the war-weary American public. As I have explained in the previous sections, US is capable of undertaking foreign intervention, US interests clash with Duterte’s, and LP has the necessary connections to make this possible. But LP’s plot to oust Duterte through US support has one vital ingredient: a President Hillary Clinton. LP knows this full well. Have you observed how LP attack pig Leila de Lima desperately frames her situation as a clash between a woman (that’s her) and a misogynistic President Duterte? Have you noticed how the LP-aligned Philippine Daily Inquirer frames the recent VP Leni Knee Joke as a another anti-woman deed by Duterte [Video]? Or how about that Agot Isidro issue [Inq], where the self-proclaimed victim happens to be a woman? Yes, the #EveryWoman campaign is geared at aligning the Duterte Ouster Plot not only with US interests, but also with Clinton’s personal crusade for women’s rights. This makes a prospective intervention in the Philippines more palatable not only for Clinton, but also for the American Public. Yes, a President Clinton is important in forwarding LP’s political interests. Duterte issued a statement as soon as news of Trump’s win broke out, with Duterte saying he doesn't “want to quarrel anymore, because Trump has won [Reuters].” This is a shocking turn of events given Duterte’s belligerence towards outgoing US President Barack Obama, best characterized by the former’s acerbic language [BBC] that made headlines throughout the world. What does Trump’s win mean for the Duterte’s Philippines? 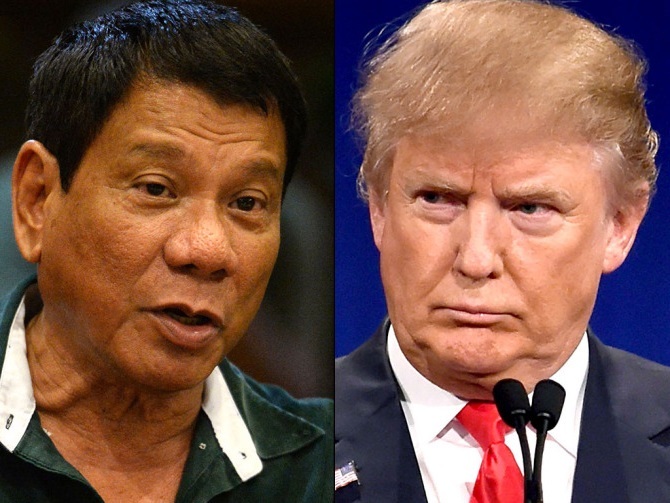 First, Trump’s win drastically impedes Duterte ouster plot. Trump’s victory basically cut off the US-Philippines Society’s connection with the highest echelon of the American political establishment. USPS supported Hillary with its chairman Negroponte being a Hillary fan, and Trump knows that all too well. Oh, and just imagine LP pushing for closer US-PH relations with a President Trump in the picture. Schadenfreude galore! Second, we can expect a less antagonistic US policy in the Philippines. Even he didn’t say it explicitly, Duterte might have anticipated a Trump win. Just a couple of days before the US elections, Duterte appointed Century Properties Group Chairman and CEO Jose E.B. Antonio's as special envoy to Washington for trade, investment and economic affairs [ABS]. Antonio, who owns Trump Tower Manila, is Trump’s Philippine partner. Duterte just executed a masterstroke. Yasay, who probably advised him on the matter, did really well. Third, warmer US-PH relations translates to a stronger bargaining chip against China. Yes, we have achieved a détente between our country and China, but relations still remain strained, as evidenced by the presence of coast guard ships in Panatag Shoal despite the lifting of the fishing ban [Inq]. However, in its bid for global dominance, it is in China’s interest to turn this détente into a rapprochement, i.e. make this relationship warmer. But President Trump – who is potentially far less interventionist than Clinton vis-à-vis the Philippines – will make it harder for China. Hence, China may decide to woo us a bit more that it intends to. And that’s good news for regular Filipinos. Bad news for LP, but good news for the common tao. I am uncertain as to what a Trump presidency will mean for the United States, but I am fairly confident that a Trump Presidency bodes well for my motherland [ThinkingPinoy]. 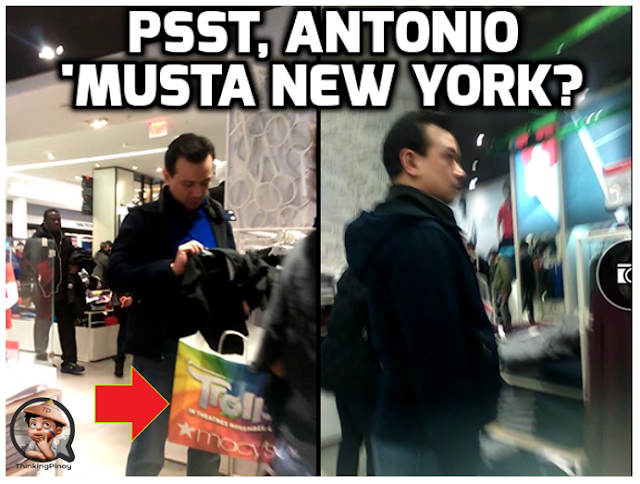 UPDATE 26 Nov 2016: Coup-plotter and Liberal Party-aligned Sen. Antonio Trillanes was spotted in Macy's Department Store in New York City. What's he doing there?